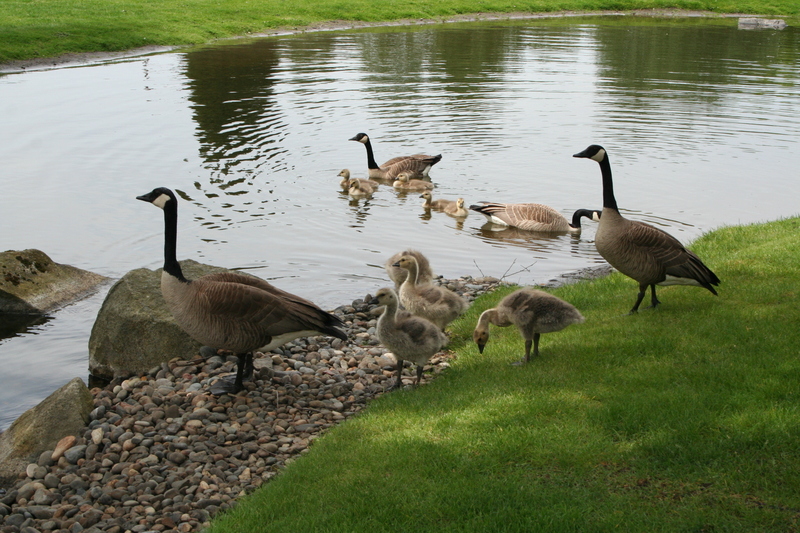 All nine goslings are still hanging out around the ponds in the business park. Jane (my walking partner) and I make it a point to go looking for them on our breaks, an act that slows us considerably. We’re certainly not getting our heart rates up except to worry over stupid geese crossing the busy street with goslings in tow. That’s a real concern, too: there are some drivers who do not even pause for pedestrians in crosswalks, why stop for a goose with goslings? That’s one of those rants I want to write about, but how do you find a photo to fit the rant? I once saw a car come too close to a pregnant woman holding hands with a toddler: she was more than halfway across the street with this idiot blasted by her at 35 miles per hour. I didn’t have my camera handy and even if I had, I wouldn’t have had the presence of mind to take a photo. I was too outraged and too scared and … well, you get the picture (pun intended). But I digress. 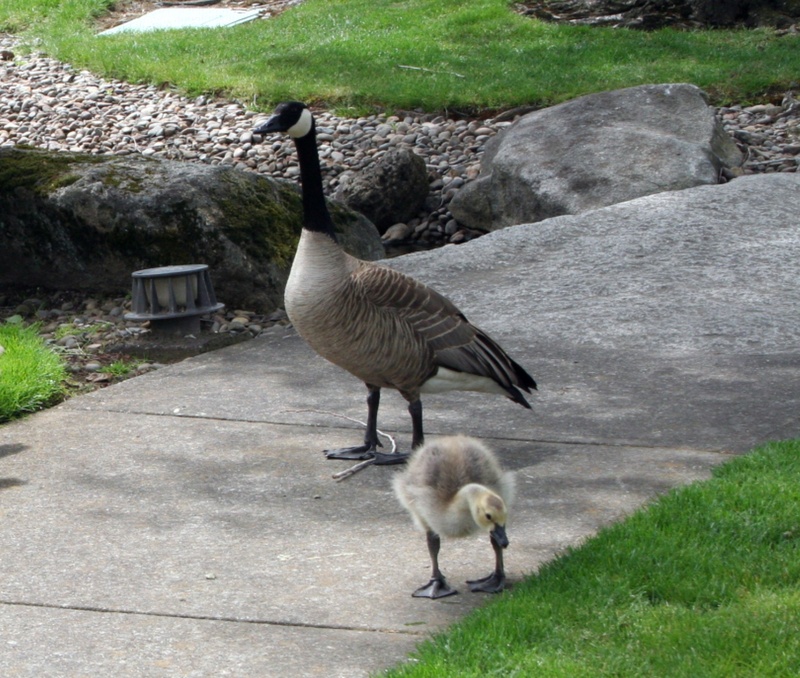 Back to geese and ducks, which invariably are the subjects of our walks these days. 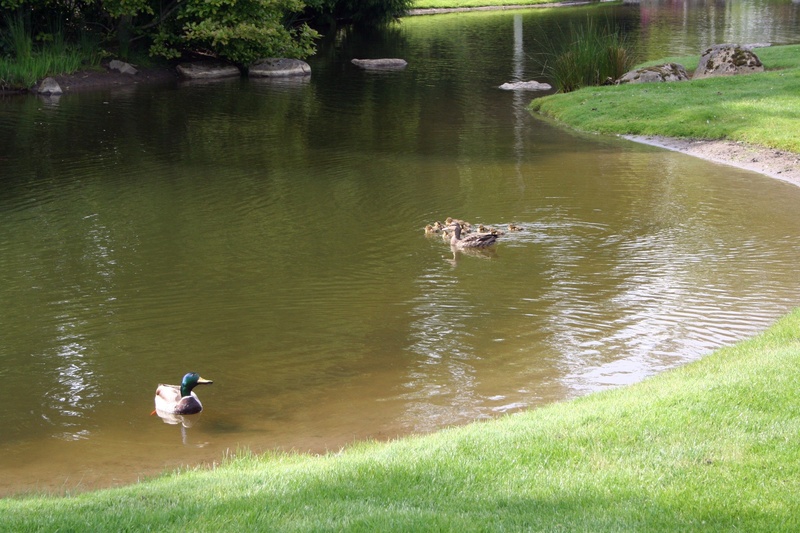 Jane & I decided to shake up our routine today and walk a pattern that takes us by all four of the major ponds (and requires us to take our chances crossing the street). Of course, the geese had moved on from pond #1 where they were when I drove in to work. So we headed off for pond #2, which is at the far end of our walk. Already we could see across the street to pond #3 where the geese were. 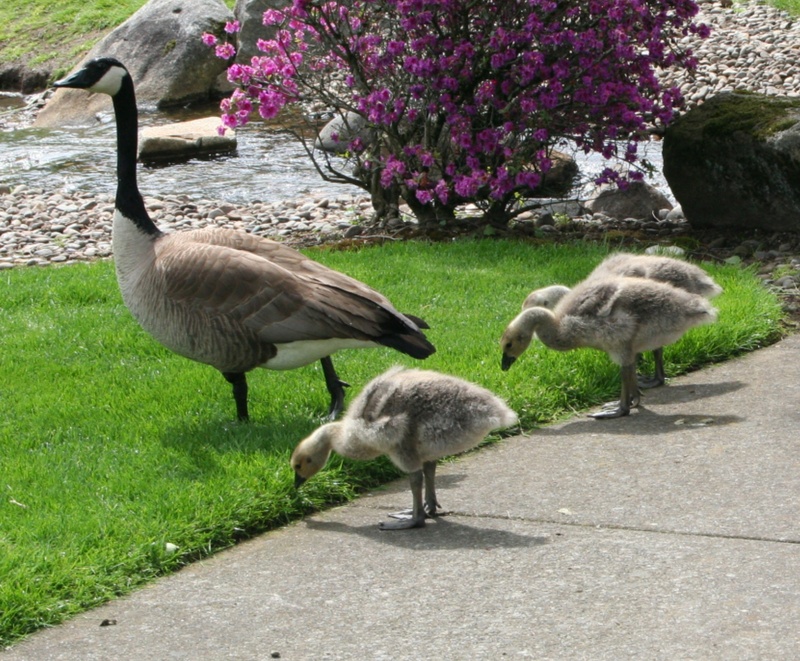 They had to cross two streets with those goslings to get there. But, oh well: we were committed to our walk to pond #2. We wondered when we might be seeing ducklings. Our geese are getting bigger and we have not seen a hen mallard in weeks. Not one. Just a few drakes here and there. Oh wow! We’re “parents” again! We have ducklings! We counted nine. It wasn’t easy: they kept bobbing in and out and around mom. 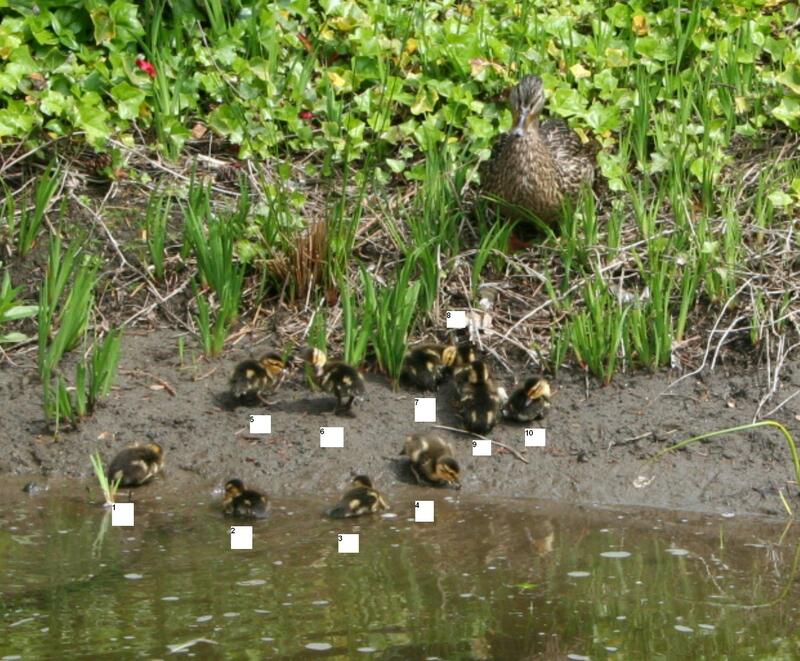 Nine ducklings and nine goslings, three happy bird families. I remember being that age, too. This gosling looks like I felt when I was a preteen. We could hardly wait for our afternoon walk: would we still have nine ducklings? Was this a smart mallard mama hen or one of those daffy ones that hops off the sidewalk in front of a semi going 35 mph? Mallards don’t have quite the parenting instinct that the geese seem to have and they’re constantly wandering off by themselves. Well, maybe this mama duck does. Look at her tender face as she surveys her little darlings as they scramble out of the water for their afternoon nap. She looks positively maternal as she gazes at her ten little babies. TEN? No, wait, we COUNTED nine. I’m sure of it. We both counted nine. I told Jane that I would have to look at the photographs because we were both certain there were only nine in the morning. Definitely ten ducklings in the AM. How’d we miss one? 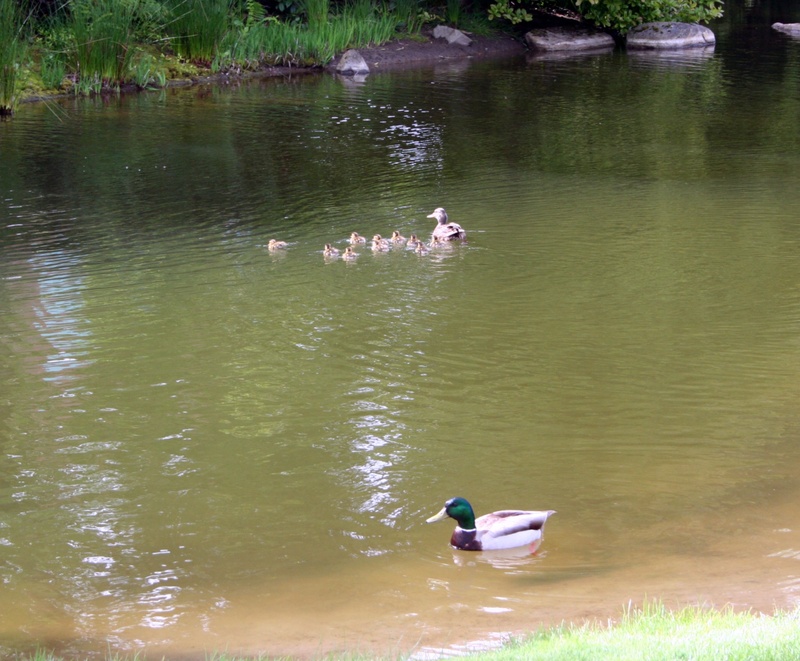 And ten ducklings in the afternoon, in the same pond. We’ll see how many make it to next week! I love the family photos! The ducklings are adorable. 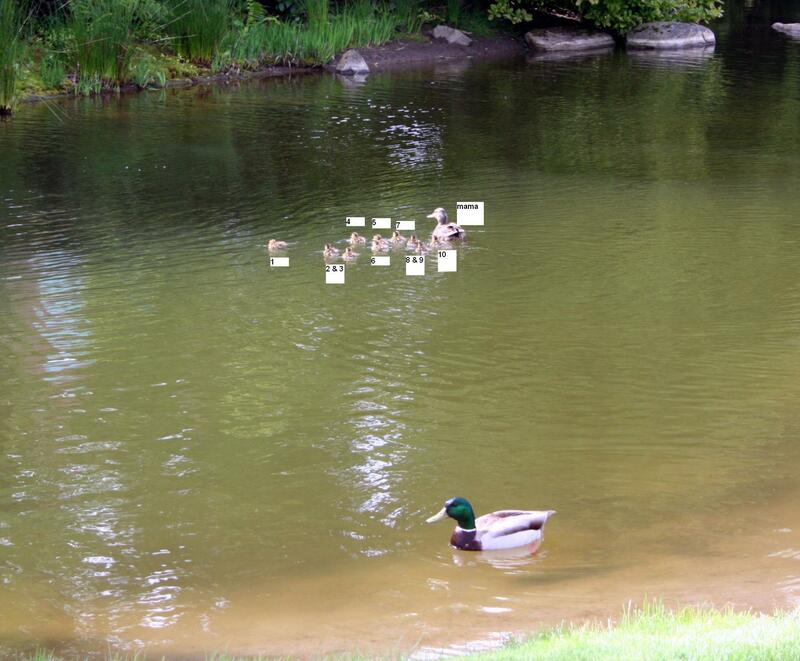 I know it’s not very likely, but I hope they all survive the traffic and whatever other dangers lurk around the ponds!